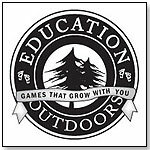 TDmonthly - Contest: Will YOU Donate 100s of Educational Products to YOUR Local Schools? Contest: Will YOU Donate 100s of Educational Products to YOUR Local Schools? Our previous contest's winning retailer, Sari Powazek of Doll House & Toy Store in Scottsdale, Ariz., said that the charities she chose were overwhelmed with specialty manufacturers' generosity, "It really hit them," Sari told TDmonthly. "I don't think they expected it. They were absolutely thrilled." "We are honored and gratified to be one of the companies selected to participate as a sponsor of a TDmonthly Charitable Giveaway in support of our schools and educational products’ retailers," said Marshall Gavin of b. dazzle, inc. "Our award-winning made-in-America Scramble Squares® 9-piece brain teaser puzzles are Easy To Play, But Hard To Solve!® for children, teenagers, adults and senior citizens." "Scramble Squares® puzzles teach patience, perseverance, fine-motor skills and critical thinking skills and help maintain mental acuity while providing a stimulating entertainment, either as a cross-generational cooperative activity or as a solitaire game." 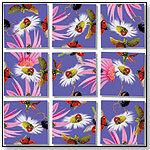 The company is donating 5 sets of 20 beautiful Scramble Squares® designs. "We wanted to be involved in the TDmonthly giveaway because we wanted to share the excitement of science with as many kids as possible," shared Jason Gibson of Amazing Science!. "We created the Amazing Science DVD to show how kids can be amazed by simple science using common materials found around the house. We're thrilled to be a part of the giveaway this year, and can't wait to bring smiles to children around the country as they discover Amazing Science!" His company is donating 100 Amazing Science! DVDs to help school systems create fun and surprising science lessons and afterschool activities. "Giving back to help out less fortunate children is very important to my company," stated Frank Crossen, President of Crossen Creations. "Charity is one of the reasons I started my company, it was put in the mission statement to help remind me of the most important mission of the company, ‘To create a better world for our children.’ Although sales have been very slow I still want to help charities and this program was a perfect opportunity to help and also get some exposure for us. Also, my company name is Charity Inspirations LLC, but it was too confusing for retailers so I now do business as Crossen Creations." He is donating 100 deluxe Magical Rainbow Boardgame and Playsets, which teach children color recognition, sequencing, patterns, counting, strategy and sharing. "It’s more than a board game, it’s a tool for releasing the imagination in every child," Frank told TDmonthly. "Bambooga is a human puzzle game where players use color wristbands to bind their hands and feet to one another, leading to a sticky mess of people," explained David Schreiber of Uncle Skunkle. "One of the factors that is most notable about Bambooga, is that the game is part of a social entrepreneurship project sponsored by Kids Ark Foundation of Thailand. Bambooga is safe and eco-friendly, adhering to "green" manufacturing practices with second-generation cloth material and sustainable bamboo construction. Bambooga uses mostly donated scrap material from factories in Thailand, and local villagers are employed to manufacture the games, bringing jobs to an area of Thailand were they are hard to come by." "Uncle Skunkle Toys supports charities all over the world and has worked very closely with organizations from Thailand to Bolivia to Nepal, as well as local groups and schools in our home town of Portland, Oregon," said David. "We have partnered with Friends of the Children – Portland through in-kind and financial contributions. Friends of the Children offers a number of valuable and beneficial programs that support the education and well-being of local children including a mentoring program that provides at least 16-hours per month of one-on-one time with each child and commits to that for 12 years, no matter what happens." PlayMais Canada Inc. is a distributor of high-quality educational toys from Europe and the US and is known primarily for PlayMais — a biodegradable crafting material that is made from corn and colored with food coloring. PlayMais is manufactured in Germany and is 100% safe. PlayMais is shapeable, cutable, squeezeable, and it sticks together with a little bit water from the PlayMais sponge, which is included in every box. The multi-award-winning Buzzlewords by The Spelling Bee Game comes in 5 levels, from 1st & 2nd grade to Adult. Inventor Richard J. Sullivan says that, "here are no other board games on the market which allow each player to spell words selected from their own grade level and which combine elements of chance, strategy and spelling knowledge in a way that makes learning to spell fun and easy." The Spelling Bee Game will donate 25 games of each of the first 4 game levels of BUZZLEWORDS — The Spelling Bee Game: Level 1— 1st & 2nd grade; Level 2 — 3rd & 4th grade; Level 3 — 5th & 6th grade and Level 4 — 7th & 8th grade. Richard is confident that the retailers and kids who get to know Buzzlewords through this promotion will get hooked on the game. "It's a great game to improve spelling," he told TDmonthly. "We want to improve the spelling IQ of America and the charity giveaway is a great way to help." READ ABOUT THE WINNING RETAILERS! 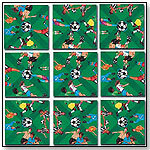 Ladybugs Scramble Squares® by b. dazzle, inc.
Scramble Squares® are nine-piece puzzles that feature original art and only one solution. They're designed for everyone from age 4 to 104. 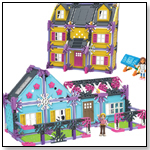 Awards: Dr. Toy's Best Picks Children's Products for 2011. 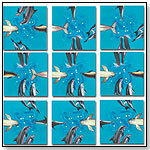 Soccer Scramble Squares by b. dazzle, inc.
Dolphins Scramble Squares® by b. dazzle, inc.
Dolphins are playful, have individual personalities and adapt well to humans, making them a popular sea mammal to kids and adults alike, making for a very enjoyable Scramble Squares® Puzzle. 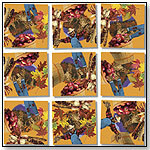 Fall Festival Scramble Squares® by b. dazzle, inc. This beautiful new ?Fall Festival? 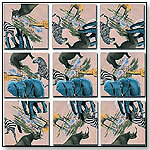 Scramble Squares® 9-piece brain teaser puzzle by b. dazzle, inc. celebrates nature?s paintbrush and the harvest ceremonies that have been conducted by many grateful cultures throughout the history of civilization. 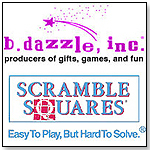 Award Winning Scramble Squares® are perhaps the World?s Most Challenging Puzzles® for ages 4 to 104. M-Boxes by PLAYMAIS CANADA INC.
PlayMais is a biodegradable crafting material made from corn and colored with food coloring. It is manufactured in Germany, 100% safe, and biodegradable. 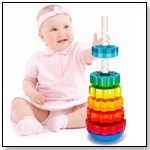 PlayMais stimulates children's imagination and creativity, trains fine-motor skills, and develops social group skills. PlayMais can be shaped, squeezed, and cut — and all it takes is a little bit water to create unlimited fun. Children can build in 2 or 3 dimensions, or wherever their imagination takes them. The PlayMais M-Box contains 150 pieces, a sponge, and an instruction booklet. It is a perfect starter box. XM-Boxes by PLAYMAIS CANADA INC.
PlayMais is a biodegradable crafting material made from corn and colored with food coloring. It is manufactured in Germany, 100% safe, and biodegradable. PlayMais stimulates children's imagination and creativity, trains fine motor skills, and develops social group skills. PlayMais can be shaped, squeezed, cut and all it takes is a little bit water to create unlimited fun. Children can build in 2 or 3 dimensions, or wherever their imagination takes them. The PlayMais XM-Box contains 250 pieces, a sponge, a biodegradable plastic knife, and an instruction booklet. It is a perfect starter box if you want to build more and bigger creations. Buzzlewords® The Spelling Bee Game Level 2 - 3rd & 4th grade by THE SPELLING BEE GAME INC.
BUZZLEWORDS® - The Spelling Bee Game is the most fun that children and adults can have while learning spelling, reading and vocabulary. Because the spelling words are taken from actual school word lists, children will master all of the spelling words for his or her grade level just by playing the game. In addition, by reading the words to the speller and by looking up the meanings of words for the speller, children will improve his or her reading and vocabulary skills while having fun, without even realizing it. Includes Game Board, Tri-Colored Die, 6 Bee Playing Pieces, 300 BUZZLEWORD Cards, 50 BUZZLEBEE Cards. Buzzlewords® The Spelling Bee Game Level 3 ? 5th & 6th grade by THE SPELLING BEE GAME INC.
Buzzlewords® The Spelling Bee Game Level 4 - 7th & 8th grade by THE SPELLING BEE GAME INC.
WHAT CHARITIES AND SCHOOLS DO YOU CURRENTLY WORK WITH? WHY DO YOU WANT TO GIVE TOYS FROM SPECIALTY MANUFACTURERS TO YOUR LOCAL SCHOOLS AND CHARITIES? IF YOU SHOULD WIN, WHAT PLANS DO YOU HAVE FOR PROMOTING THIS EVENT TO YOUR CUSTOMERS AND LOCAL PRESS? IF YOU SHOULD WIN, HOW WILL YOU USE YOUR GIFT PACKAGE OF ONE PRODUCT FROM EACH MANUFACTURER TO CONDUCT A RAFFLE OR CONTEST IN YOUR STORE?